The weird 2017 season continues. As Bob Chavez pointed out on IL Indoor, last year’s Champions Cup finalists are a combined 0-4 while the teams that missed the playoffs are 5-2. 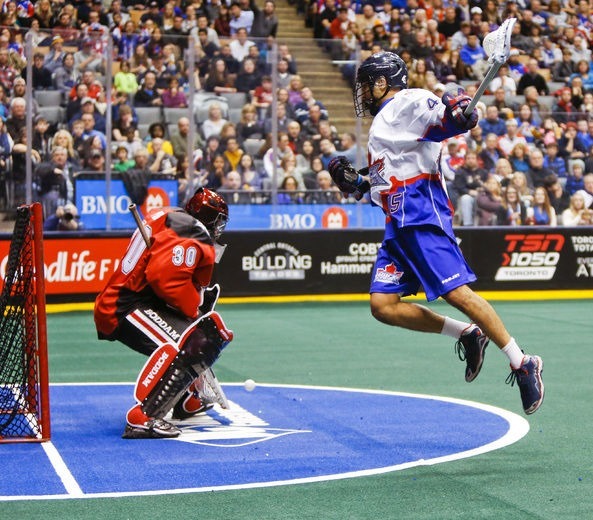 One thing that has continued from last season is the injury bug plaguing the Toronto Rock. Stephen Leblanc has missed both games so far and then Brett Hickey was injured during practice and is now on the IR. But rather than make their absence the story of the game, the Rock’s new guys stepped up to make sure that didn’t happen. And since there are a lot of Rock new guys, this was significant. One question was directed at the Rock by many fans throughout this game: Who are these guys? Ten players in the lineup weren’t on the team last year (eight (!!) first-year players, Damon Edwards, and Steve Fryer who was on the practice roster), while five of last year’s top six offensive players (Doyle, Sanderson, Hickey, Hellyer, Leblanc) weren’t there. Every Rock goal except one unassisted goal from Brad Kri involved at least one player who was not on the team last year. Kieran McArdle and Tom Schreiber continue their strong rookie campaigns; neither one looks like they had never played box lacrosse a couple of months ago. But even bigger additions to the Rock are the transition guys. Brodie Merrill is having a bit of a resurgence at the age of 35. Damon Edwards (dumb penalty in the third quarter notwithstanding) is looking great in his return from missing all of last year, Jesse Gamble is Jesse Gamble (which is a very good thing), and I’m liking the addition of Challen Rogers more and more every game. I said after the first Rock game that if the Rock score ten transition goals a game, it doesn’t matter much how their actual offensive players do, and that seemed true after this one as well. The same “Who are these guys?” question was directed at the Rush during the first half, though it was less literal. The guy wearing the Bold jersey wasn’t making stops that the real Aaron Bold generally would, the best defense in the league (and one of the best ever) was allowing all kinds of shots on the aforementioned Bold, and the offense couldn’t score to save their life. The Rush we were all expecting showed up in the second half. Mark Matthews looked as dominant as ever, and Robert Church also had a great game. I honestly didn’t notice Adam Jones or Ryan Keenan much but Mike Messenger scored a beautiful diving cross-crease goal. This reappearance of the real Rush almost had them pulling off the comeback that Rock fans knew was possible. For one eighteen minute span, the Rush outscored the Rock 8-1, turning a 10-2 blowout into an 11-10 nailbiter. Fortunately for the Rock, that’s as close as it got. As a Rock fan I’m glad the Rush never tied it up although I have to say as a guy who writes a weekly column on clutch goals, it wouldn’t have been so bad. Considering the Rock missed the playoffs last year, lost Doyle and Sanderson to retirement, and lost Hellyer, Leblanc, Sorensen, PMerrill, Marshall, and Miller to injury (and Hickey for game 2), it’s hard to believe they’re 2-0 and looking as strong as they are. I’m sure they’ll fall back to earth soon – nobody is expecting 18-0 – but I for one am going to enjoy this ride as long as it lasts. My thoughts are with Rock PA announcer Bruce Barker as he recovers from a stroke. I don’t know who the guy was doing the PA but he did a pretty good job with one exception – when replacing someone who’s been doing a job like this for years, don’t try to be him. He used a number of Barker catch-phrases that he probably shouldn’t have, IMHO. In previous years, the team was always announced in numerical order but Colin Doyle was always last and prominently announced as the captain. (“Your captain, my captain, our captain”). Brodie Merrill was listed in numerical order and his captaincy was mentioned almost in passing. One wonders if Merrill himself asked for this lack of special treatment. Connor Buczek was included the player announcements although he’s on the practice roster. He wasn’t at the game. Brodie Tutton, also on the practice roster, was not listed. Ryan Dilks was ejected for instigating a fight with Kieran McArdle after McArdle crashed into Aaron Bold. I’m one of the most outspoken anti-fight people around, but I didn’t think Dilks deserved to be tossed for that. Five each would have been fine with me. Of course as a Rock fan, removing the reigning Defender of the Year from the game in the 2nd quarter was also just fine. Nice of the Rock to recognize Josh Sanderson, though doing it between quarters rather halfway through a TV timeout would have allowed for a longer ovation. Not a single challenge was issued by either coach. This entry was posted in Game Review, Saskatchewan Rush, Toronto Rock. Bookmark the permalink.